It is hard to believe January is almost over though it does feel like the holidays were a long time ago! I am back to publicly menu planning this week – seems like I’m on an every other week schedule right now! Though I still have a plan in place – whether or not I actually post it here. 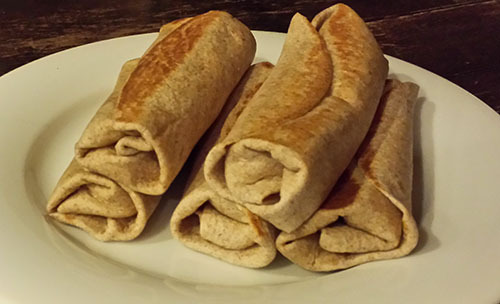 I made the Zucchini Bean & Cheese Burritos (pictured above) on a whim for my family. They couldn’t be easier! And best of all, leftovers get frozen for future quick meals. You can adapt it any way you want it. But basically, I grated a zucchini. Then I sauteed it in a little bit of olive oil with some minced garlic. I added a can of refried beans and then stired in a bit of salsa and heated through the mixture. Next, I scooped some of the mixture into whole wheat tortillas and topped with grated Monterey Jack cheese. Then I rolled up the burritos and put in a skillet to brown on each side. I mixed some plain Greek yogurt and salsa to serve on the side for dipping. I was quite surprised when both of my children asked for the dipping sauce and they gobbled them up! These will be very handy to have on hand as we move into baseball season and need quick dinners before or after our games.